Nike's been teasing a new evolution in basketball sneakers for a while, but now the world's largest shoe maker has unveiled 'the future of the game' with Nike Adapt BB – high-tech shoes which are not only self-lacing and app-controlled, but will also automatically adjust to the foot. “We picked basketball as the first sport for Nike Adapt intentionally because of the demands that athletes put on their shoes,” says Eric Avar, Nike VP Creative Director of Innovation in the company's announcement. He continued, “During a normal basketball game the athlete’s foot changes and the ability to quickly change your fit by loosening your shoe to increase blood flow and then tighten again for performance is a key element that we believe will improve the athlete’s experience." According to Nike, the Adapt BB uses a custom motor and tension-sensing gears to automatically adjust the snugness of each sneaker on a player's feet. Using the Nike Adapt app, players can also manually input different settings and tensile strength, with the laces capable of pulling 32 pounds of force, which Nike says is roughly equivalent to "that of a standard parachute cord". Nike's FitAdapt technology will also be receiving regular firmware updates which players can opt into, making Adapt BB the company's "first continually updated performance product" with a precision fit that will get better over time. 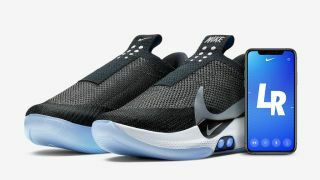 In keeping with the high-tech nature of the shoes, Nike Adapt BB will ship with a Qi wireless charging mat (pictured above) in the box, and wearers will also have full control of the LED lights in the shoes' soles, allowing them to change lighting colors on the fly. Nike Adapt BB will be available from Nike's online store from 10AM (EST) on February 17 and will be priced at $350 (around £272 / AU$486).